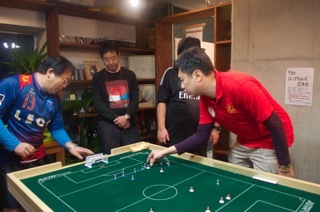 5292 km away from home, two passionate Singapore table football players, John Ho and Rudy Hesty travelled up to the land of the rising sun to pit their skills against Japanese and other international flickers in the Japan Yokohama International Open Subbuteo tournament. 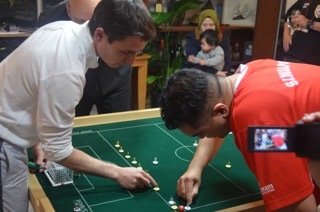 A large field of 33 players participated in the one day event with high expectations on the local boys to do well as both hold great experience and had recently played in the biggest stage of table football – the World Cup. Going into the game, both players were in good form with John Ho, ranked 63 in the FISTF World Ranking, breezing his way past the 3 man group with 3-0 and 3-2 score line in Group 2. 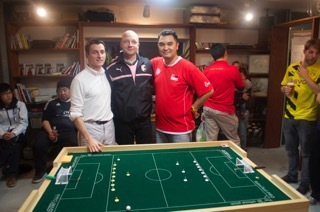 Rudy, who was in Group 6, was also following suit by beating his opponents comfortably with 6-1 and 4-1 score line. 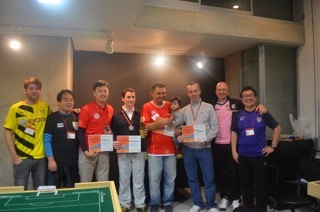 Qualifying together with them (just to name a few) was defending champion – Cedric Garnier (France), local favourites – Kenzo Koi and Hideaki Wada; title contenders – Stephane Lambert (Belgium), Antonio Carabillo (HK) and dark horse – Alexander Busing (Germany). The second round of games nearly caused a shock for our local hero, John Ho. With about 10 minutes to the end of the game, John Ho was down 1-3 to his Japanese opponent – “rising star” Taichi Kato. Fortunately, experience prevailed as John managed to pull back the score to 3-3 and eventually won in the nail biting shoot-out. As for Rudy, his journey was more comfortable as he out-scored his opponent 5-1; thus advancing to the quarter-finals with both of our local players now drawn against both Japanese local favourites. The games against experienced opponents – Kenzo Koi and Hideaki Wada were closely fought; with both of our local players only securing marginal wins in their games. John won 1-0 against Hideaki Wada while Rudy won 2-1 against Kenzo Koi. It had to happen – both our local heroes were paired up against each other. 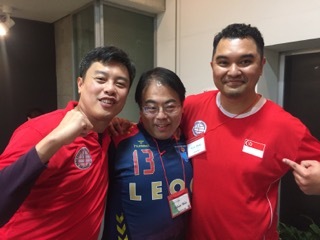 The positive note was that one Singapore player would be definitely represented in the Final but the downside was that the meeting was one step too early. John Ho, finalist of the previous FISTF Grand Prix in Japan was a notch favourite against Rudy who was on a hot streak of scoring goals. The game started off like a chess battle with both players applying cautious moves and not letting the opponent even have a sniff of the goal. It took about 11 minutes before the 1st clear break happened. John capitalised on Rudy’s midfield mistake and scored a beautiful chip goal, with the 1st half ending 1-0 to John. Second half started with Rudy bombarding John’s stubborn defence; eventually, the defence caved in. Rudy scored from a throw-in attack and the score was 1-1. With normal time also running out, Rudy had a break-through when his attack penetrated the middle of John’s defence. With the defence breeched, Rudy scored with a defying chip into goal. Final score – 2-1 to Rudy. It was the first final for Rudy in an overseas competition and he was to play against the overwhelming favourite – Cedric Garnier (France). Cedric who remained undefeated in Japanese tournaments to-date, was up against Rudy again after 2 years. Both played in the Singapore Open tournament where the latter suffered a 1-0 defeat. Could Rudy avenge the defeat or would Cedric continue to dominate the Japanese scene? The game kicked-off with both players attacking each other frantically. It was expected to be a one-sided affair favouring Cedric but Rudy was proving the in-house bookmakers wrong when he struck the first blow and scored. Cedric tried hard to penetrate through Rudy’s goal but Rudy’s goalkeeping was superb, as he made several saves from sure-goal efforts. Half-time score was Cedric 0 vs Rudy 1 … could this be an upset in the making? The second half started with Cedric pushing his attack furiously at Rudy’s defence. Again and again the defence stood strong but the resistance did not last as 5 minutes before the end, Cedric’s flick managed to squeeze the ball past Rudy’s diving keeper.Score was 1-1 and in the final minute, Rudy had a great chance to score. A dream of finally breaking Cedric dominance was in front of Rudy’s eyes. With a strong flick of the index finger he propelled his Man City player onto the ball which cannoned towards Cedric’s goal-post. Was it going in? … No!! … Cedric manoeuvred his goalkeeper and blocked the shot; the ball bounced off the goalkeeper and rolled rapidly towards Rudy’s goal. Cedric reacted swiftly and when the ball crossed the shooting line, he smashed a shot at Rudy’s empty goal. Goal!!!!!!! … What a way to score the winner!! Cedric jumped in joy while Rudy slumped in despair. A few seconds later, the game ended with Cedric crowned the Champion. Even though both Singapore players did not manage to bring back the winning trophy; both players showed great determination and perseverance to reach the Semi-Finals and the Final. Well done!! To both John Ho and Rudy.